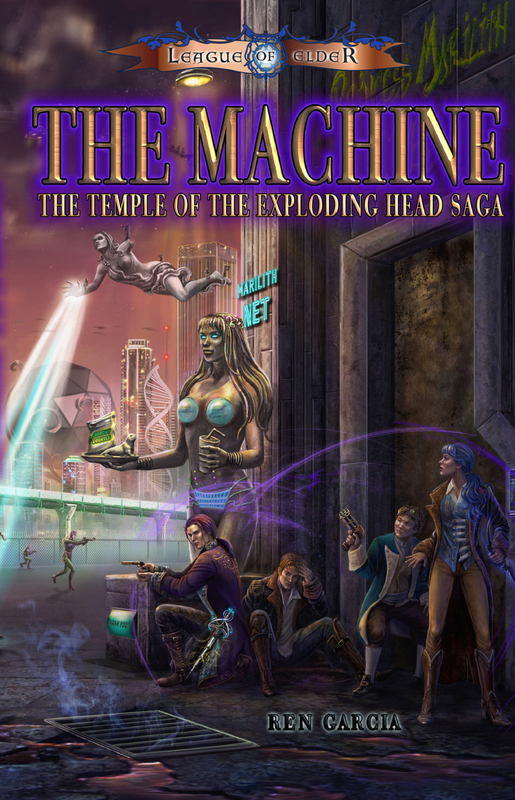 THE MACHINE is the second installment in the Temple of the Exploding Head trilogy. The book deals with Lord Kabyl of Blanchefort’s quest to recover the three pieces of an ancient machine known as the Oberphilliax and his growth from an unsure boy to a confident young man. In a desperate attempt to force her love, Lord Kabyl of Blanchefort, to improve his sadly lacking Gifts, Lady Sammidoran of Monama created three powerful manifestations from Nightmare magic, each representing one of his three Gifts (Waft: a teleportation, Cloak: invisibility, and Sight). While on the planet Xandarr, Kay is visited by the manifestation of Waft. Waft will put Lord Kabyl to the ultimate test, and, if he fails, he will die. Lord Kabyl of Blanchefort: Son of Captain Davage and Countess Sygillis. He is a Shadow tech male. Judge of the Trials: A giant bronze man also created of Nightmare magic. Within his hollow chest sleeps Lady Sammidoran. She will not emerge until the Trials are complete. In the far distance, he saw something moving through the air. A chariot, floating on the wind, pulled by three naked women and driven by a tall, statue-like bronze man, approached. Soon, Kay was backed into the room, the tall man looming over him in his chariot. The orange eyes of the three women pulling the chariot glowed in the dark. “Where is Sam?” Kay asked. Without answering, the chariot turned, and the remaining two women pulled him back out into the night air. He was gone as quickly as he came. Kay and the woman stood there staring at each other. Her mud-like appearance cleared up. Now, with the exception of her orange eyes, she looked just like Sam. Her mane of black hair went down to her ankles, and her naked body was inviting if he allowed his mind to wander. Kay, remembering the night in the Grove, started dressing. Kay finished dressing and saddled his CARG. She looked him over. Kay went to the terrace and peered over the side. He was two stories up, about sixty feet to the grass below. He decided it was best to try and get this over with and comply with her wishes. He stood straight and began to Waft. Slowly, he could feel the usual funnel of air begin to build up around him. “No!” Waft screamed, incensed. “Too slow! Too clumsy!” She strode up to him as the wind began to blow and punched him hard in the stomach, doubling him over. She then picked him up with one arm and threw him over the side of the terrace like a sack of laundry, where he landed in the grass below with a cry. She helped him up. “Anything broken?” she asked. She took his left hand and savagely broke his pinky. Kay reared back and choked down a scream. “I’d Waft away if I were you,” she said breaking the next finger in a grotesque fashion. Kay tried to pull his hand away, but her grip was unbreakable. “Waft, Kay!” she yelled. Pain and nausea flowed through him. Just as she was ready to break his long finger, there was a rush of wind and Kay was gone. He had Wafted back up to his terrace. He stood there holding his hand, agony throbbing through him. The room began to fall to amber. He could see his broken fingers. He could see the snapped bones under the skin—nice clean breaks. Nothing that couldn’t be repaired. Incredible pain. He concentrated and pulled his Sight back to normal. Now wasn’t the time. “About sixty or seventy miles—what difference does it make? Here, I’ll give you a head start.” She picked Kay up with one arm and threw him off the terrace again. This time he Wafted with a quick blast as he tumbled through the air and appeared several hundred feet away, landing on his feet. He looked back. 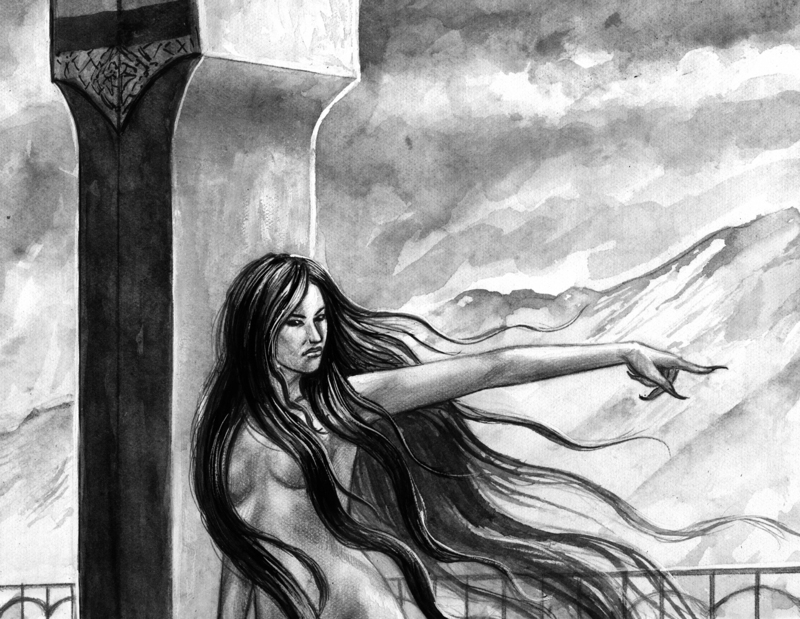 She was standing there on the terrace, her pale body framed by her black hair. “Better move!” she yelled, her voice echoing. He was standing on the ground, surrounded by tall trees, he couldn’t even see the mountain from where he was. Using the moons overhead as a directional guide, he started running. He’d taken a few steps when he was roughly clothes-lined by Waft’s soft but strong arm. He hit the ground holding his throat. She pulled a medium-sized tree out of the ground and made to slam it down on Kay. He jammed his broken fingers, creating a spray of pain and Wafted several hundred feet away to the top of a distant tree. She threw the tree aside and followed in a blast. The race with Waft was on in earnest. Wow! That’s the greatest description of a horrible and incredible scenes I’ve ever read! I could almost smell the blood, touch the weird creatures’s bodies, and feel the pure energy of the horrible but amazing god… It’s a perfect combination of Chronicles of Narnia and Steven King and Dean Kuntz’s novels! Were you inspired by them for your story, my friend? It seems you are thinking the same way as me: every author should strive to create new creatures, the classical, öld like vampires, elves, dwarfs, wizards with sharp hats, fairies, etc. are too ordinary already? That’s why I try some new in some of my books (weightless korks, glowing, living balls, Brown faces, fiery men, one-eyeds, night fruit, rock pieces, fish-keepers, etc…). Will be glad to read your works! They really look fascinating! Wish you all the best! Let the wonderful noise of the sea always sounds in your ears! (a greeting of the water dragons’hunters – my Tale Of The Rock Pieces). What an endorsement, thank you very much!! I love this series and I can’t wait to share it. It used to be a single gigantic tome topping the 300,000 word mark. The publisher, however, wanted it chopped down into three smaller works, which gave me the opportunity to develop and expand certain plot points. Thanks again for your thoughts and I can’t wait for March to get here! !